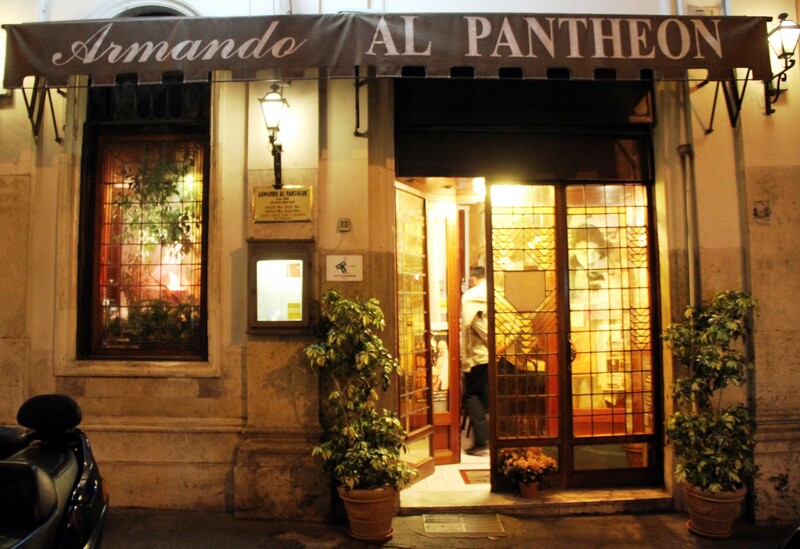 I had the good fortune a few moments ago to dine at Armando al Pantheon, in Rome. Just steps from the Pantheon, Armando offers a paradise amidst a sea of mediocre and embarrassing tourist traps. As my friend Katie Parla has documented, restaurant culture in Rome has declined in the last decade, and it is harder and harder to eat well in the historic center of Rome. Armando feels like the most unlikely and precious of gifts. Armando is a traditional Roman trattoria. That is, it is family run (multi-generational), small (about 30 seats), and traditional (mostly classic Roman dishes). By a stroke of great luck, it was the first place I ever ate in Rome, and I’ve been going back ever since. The kitchen at Armando is run by Claudio, while his brother Fabrizio runs the dining room, and what is most remarkable about Armando is that Claudio’s cooking is pitch perfect every time. In a city where even the best restaurants do some dishes better than others, Armando has a consistency which places it in a special class. All good cooking, like most good things, is based on having good taste. This is the difference between a decent and a great string quartet performance, or a decent performance and great performance of a play. Good taste is hard or impossible to teach, but those that have the gift can perceive it. Tonight at Armando, I had one of the most classic and simple of Roman pastas: spaghetti all’ aglio, olio, e peperoncino (garlic, oil, and hot pepper). As I’ve written before, this is one of the most devilish sauces, because its minimal ingredient list requires everything to be perfect and balanced. At the center of successful cooking is proper seasoning with salt, the ability to draw out flavor from ingredients, but in a subtle and unobtrusive way, in a way that simply makes the ingredients taste more of themselves. This is this gift Claudio seems to have. Every bite of his cooking is full of character, but one never tires or wearies eating his cooking, as is the case in so many restaurants, particularly good ones in America. In America, so many chefs seem trained to produce flavors which are exciting for a few bites, but quickly make one weary through over-seasoning or lack of freshness. Others restaurants, such as the one I visited for lunch today, offer excellent dishes, but portion size is so overwhelming that the dishes can hardly be enjoyed through the end before weariness sets in. This elusive quality of balance and taste is what we strive for at Old Tioga Farm, and dining at restaurants such as Armando inspires us to seek that same ideal. Great cooking is not at all about being a “celebrity chef”, but rather about the ability to be humble enough to make one’s cooking about honoring the integrity of high-quality ingredients. As my friend Katie explained today, even many Romans have lost the taste for quality that is needed to appreciate Armando. If you find yourself in Rome, go to Armando. You might not speak Italian, you might not be Roman, you might show yourself immediately to be a tourist, but express delight in Claudio’s cooking, heap praise upon the wonderful dishes that come from his kitchen, and you’ll earn gratitude and appreciation from one of Rome’s finest restaurants.